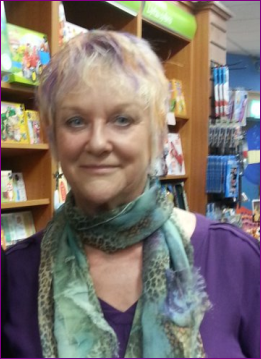 I have written four novels and each has been independent – different settings, different characters, different themes – but I have begun to feel the allure of keeping a story going, beyond the last page of a book. I have written short stories that accompany my novels, but I’ve never yet been brave enough to take on a whole series. 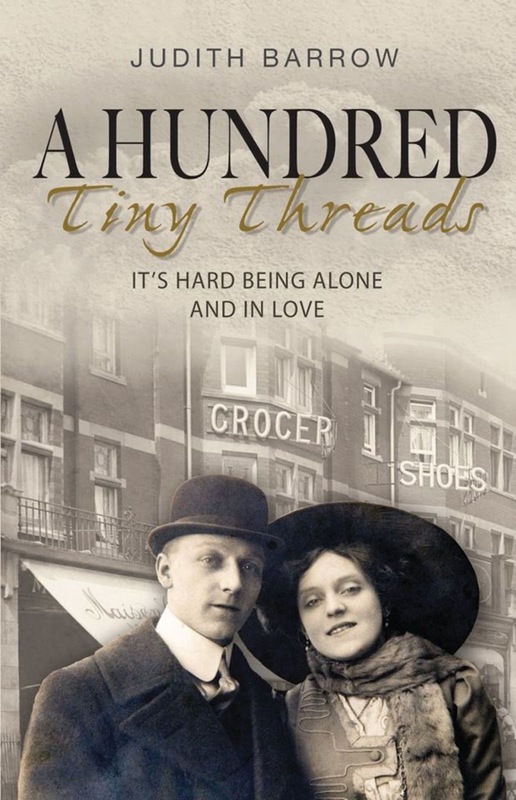 That is what Judith Barrow has done, with her Howarth Family trilogy, covering the decades from the Second World War to the late sixties, and she has completed it now with a prequel, A Hundred Tiny Threads, covering the early decades of the 20th century. I am hugely impressed. Pattern of Shadows is the first of the Howarth family trilogy. Mary is a nursing sister at Lancashire prison camp for the housing and treatment of German POWs. Life at work is difficult but fulfilling, life at home a constant round of arguments, until Frank Shuttleworth, a guard at the camp turns up. Frank is difficult to love but persistent and won’t leave until Mary agrees to walk out with him. 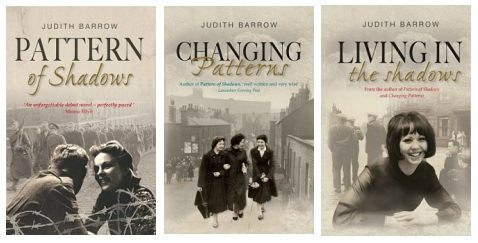 Sequel to Pattern of Shadows, Changing Patterns is set in May 1950, Britain is struggling with the hardships of rationing and the aftermath of the Second World War There are many obstacles in the way of Mary’s happiness, not the least of which is her troubled family. When tragedy strikes, Mary hopes it will unite her siblings. Will the family pull together to save one of their own from a common enemy. The last of the trilogy, Living in the Shadows is set in 1969. 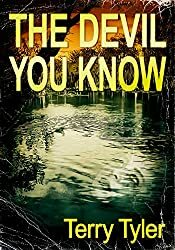 There are secrets dating back to the war that still haunt the family, and finding out what lies at their root might be the only way they can escape their murderous consequences. And so to the prequel: A Hundred Tiny Threads: Winifred is a determined young woman eager for new experiences. 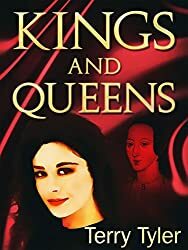 When her friend Honora – an Irish girl, with the freedom to do as she pleases – drags Winifred along to a suffragette rally, she realises that there is more to life than the shop and her parents’ humdrum lives of work and grumbling. Bill Howarth’s troubled childhood echoes through his early adult life and the scars linger, affecting his work, his relationships and his health. The only light in his life comes from a chance meeting with Winifred, the daughter of a Lancashire grocer. For the record, in my opinion, this is a great book, that places two people in the midst of some of the most earth-shattering and horrifying events of the early 20th century but shows it all through their very individual eyes, coloured by their own uniquely troubled situations. And, of course, knowing how it ends in the following trilogy adds a piquant regret to the tale. 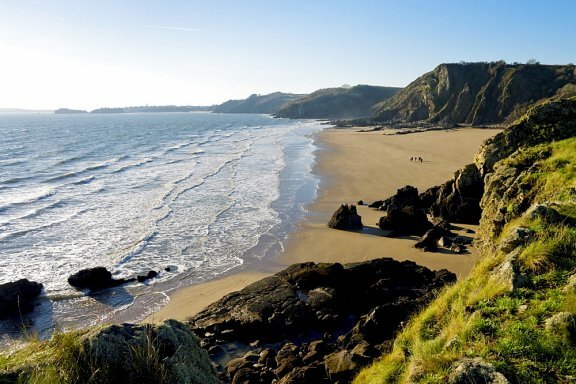 Judith, like me, has lived in Pembrokeshire for many years and, like me, came here from a distant galaxy long ago and far away – Well, Yorkshire in her case and Bedfordshire in mine. Here, she tells how she came to Pembrokeshire. We found Pembrokeshire by accident. With three children under three, an old cottage half renovated and a small business that had become so successful that we were working seven days a week, we were exhausted. David, my husband, thought we should get off the treadmill; at least for a fortnight. Pre-children, cottage and business, we always holidayed in Cornwall. But we decided it was too far with a young family and an unreliable van. We’d go to Wales; not too difficult a journey from Lancashire, we thought. Once that was mentioned, David was eager to see Four Crosses, near Welshpool, where his grandfather originated from. ‘We could stay there,’ he said. ‘But the children will want beaches,’ I protested. ‘And I’ve heard Pembrokeshire has wonderful beaches. We agreed to toss a coin and Pembrokeshire won. We’d call at Four Crosses on the way home. I borrowed books on Wales from the library and, balancing our 8-month-old twins, one on each knee, I read as much as I could about the county. It sounded just the place to take children for a holiday. We booked a caravan and, when the big day came, packed the van to the hilt with everything the children would need, remembering only at the last minute, to throw a few clothes in for ourselves. In 1978 there was no easy route from the North of England to West Wales. We meandered through small lanes, stopping for emergencies like much needed drinks, picnics, lavatory stops and throwing bread to the ducks whenever our eldest daughter spotted water. I’d learned to keep a bag of stale bread for such times. The closer we were to our destination the slower we went. In the heat of the day the engine in our old van struggled; we needed to top up the radiator every hour or so. For the last 50 miles we became stuck in traffic jams. We got lost numerous times. All this and three ever-increasingly fractious children. We arrived at the caravan site in the middle of the night so were relieved to find the key in the door. The owner, a farmer, had given up and gone home. I woke early. Leaving David in charge of our exhausted and still sleeping family, I crept out. The sun was already warm; a soft breeze barely moved the leaves on the oak tree nearby. Skylarks flittered and swooped overhead, calling to one another. Although the caravan was one of four in the farmer’s field, we were the only people there. It was so quiet, so peaceful. I walked along a small path. Within minutes I was faced by a panorama of sea. It seemed so still from the top of the cliff, but the water blended turquoise and dark blue with unseen currents, the horizon was a silvery line. Faint voices from two small fishing boats carried on the air. The sandstone cliffs curved round in a natural cove. Jagged rocks, surrounded by white ripples of water, jutted up towards the sky. I fell in love with Pembrokeshire. I’d always liked living so close to the Pennines. The moors, criss-crossed by ancient stone walls, were glorious with wild rhododendrons in summer, heather in the autumn. Even when brooding under swathes of drifting mist or white-over with snow, I was happy there. But Pembrokeshire has a powerful glory of its own. Within months we’d thrown caution, and our past lives, to the wind and moved here, much to the consternation of our extended family; as far as they were concerned we were moving to the ends of the earth. But it was one of the best decisions of my life. Hi Terry, good to see you here today. Please tell us first,what is the ultimate goal you hope to achieve with your writing? To write something so amazingly good I can’t believe I’ve written it. I doubt that will ever happen, though; even if it did, I’d probably still spend half my time thinking it was rubbish. Maybe there never is an ultimate goal with anything creative, as there is always more, a different direction in which to progress. You never get to a point when you think, ‘right, I’ve done it, I’ve got there, so I’ll stop’. People often ask writers, ‘is your main character supposed to be Joe/Bob/Steve?’ But he rarely is; writers make stuff up. That’s what we do. Experience fuels the imagination, that’s all; I’d say my characters are 80% my invention, 20% taken from real life. I write on every day that it’s possible to do so. Aside from family commitments, anything else has to fit round it. I give myself deadlines for completing each draft, just because I work better that way. When the book’s gone to my proofreader, I catch up on stuff I need to do (guest blog posts, emails, etc), and kid myself I’m going to do some jobs around the house. However, I’ve always got the next book waiting in the wings (ie, my head!) and so the process begins again, and the bedroom remains unpainted. An opening chapter with threads that make you eager to know what’s going to happen. Characters that jump off the page and into your thoughts; if you don’t care what happens to them, you have no impetus to keep reading. 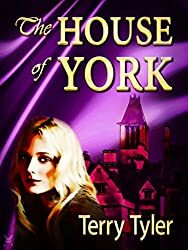 A feasible plot, with unexpected developments that don’t seem as if they’re just there for the sake of making ‘plot twists that will blow your socks off’ claims on Amazon. Resolution for each aspect of the story (unless part of a series). An ending that stays with you after you’ve read it. Twenty-five (I think). Fourteen of them are published, with another finished and in the preparation process (Lindisfarne, which may be out by the time this post appears!). I can’t name one favourite, but I have special affection for the most recent, Tipping Point and sequel Lindisfarne, because they’re part of a series, which I think about all the time! 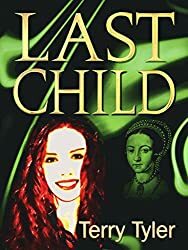 My other favourites are The House of York and Last Child, family sagas inspired by events during Tudor and Plantagenet times. I would never describe my own book as a ‘must-read’; that’s for the reader to say, not me! The Project Renova series, of which Tipping Point is the first book, is about a global pandemic, and also, initially, about how public opinion is manipulated by the media. Nothing you say on the internet is private. 3. When the going gets tough, people’s true selves come to the fore. No moral lessons, though. I don’t think. It’s your imagination, your fingers on the keys. Sometimes a character will turn out differently from how you intended, mostly because unexpected ideas about how to develop the character appear while you’re writing, but it’s still you in the driving seat. I don’t go in for all this ‘I wanted to make Sebastian a modest shopkeeper, but he just wasn’t having it!’ stuff. I first wrote a novel in 1993, when I was thirty-four. I might get it out and have a cringe-athon some time. If I have, I can’t think what they are. Or maybe I’m just not telling you. Smiley face with wink. I haven’t got one. I’m not that interesting. I just sit down at my desk and get on with it. Oh dear, this is where I’m supposed to reveal all my fascinating and unusual hobbies, isn’t it? Thing is, I mostly just write, and when I’m not, I do the same relaxation/leisure time stuff as most people. You know, watch stuff, read, go for walks, clean the house. Okay, I’m lying about the last one. I read a lot and review books on my book blog, and for Rosie Amber’s Book Review Blog. I’ve recently become a vegan. It’s difficult, but at least it stops me raiding the biscuit tin. I can see myself eating vegetable stir fry with Quorn for dinner every night; I’m not very interested in cooking. Tipping Point, released on August 7th. Post apocalyptic/government conspiracy/family drama. Patient Zero, hopefully ready to publish in December 2017. Outtake short stories related to Tipping Point, Lindisfarne and Book 3 of the series, yet to be written.